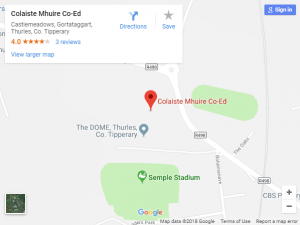 Set in the leafy surroundings of Semple Stadium in Thurles, Coláiste Mhuire Co-Ed is uniquely the only secondary school to provide a co-educational environment in the Thurles region. We have been serving the community since 1928. We believe that our school offers a distinctive and innovative approach to each and every student’s education. We provide a forward thinking programme of study. We are one of the first schools in Ireland to offer the Junior Cert Student Awards Short Course in programming and coding. This reflects our expertise and facilities in this regard. We also provide a Guidance/Study Skills class for all first year students to ensure that they have the necessary skills to work independently and creatively. We are also delivering the short course in PE. We provide excellent support for students in English, Irish and Maths. As a school that is involved in the Delivering Equality of Opportunity in Schools programme we provide excellent opportunities for students in terms of their achievement in literacy and numeracy. Our transition programme from primary to secondary school has proven to be very beneficial. As many of our students come from small country schools we invest heavily in this programme to ensure that all our incoming first years feel happy and safe at school. We have a firm but fair approach to discipline. We applaud and reward success and encourage our students to achieve their potential in every area. This is reflected in a rich and diverse reporting of Other Areas of Learning, in line with the new Junior Cycle. Many of our students go on to study at third level and we also offer PLC courses as a bridge to other third level courses. To access our PLC brochure please click here. Our campus is a safe and content college and we endeavour to keep it that way and we strive to provide our students with the best possible start to life and to instil in them the values that our school motto promotes; ‘Rath as Saothar – Success through Effort.’ A value we believe prepares all our graduates with a maxim that will lead them to achievement. Take a tour of our School Facilities below.